Finding an affordable 2 bedroom apartment for your family isn’t easy. Luckily, you’ve found Siegel Suites! Our large, unfurnished and furnished two-bedroom apartments offer you the choice of several locations, surprisingly cheap rent, and great apartment extras at no extra cost – like free premium cable TV, free utilities, swimming pools, laundry facilities, and much more. Plus, you can rent your 2 bedroom apartment with no long term lease, no long-term commitment, and bad credit check. 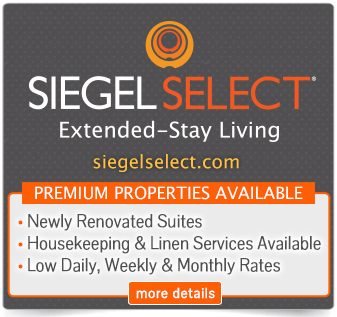 Call us at 1-888-328-0192 to rent a 2 bedroom apartment at Siegel Suites today!